While this sort of post is normally relegated to our Twitter activities, this is too good of a deal to not post here as well. Plus, I've been begging Amazon to offer some daily deals (and freebies) in the soundtrack genre. Well, they come through with WENDY CARLOS' classic 80s score to the original TRON. You can get it TODAY ONLY at AmazonMP3 for just $1.99! 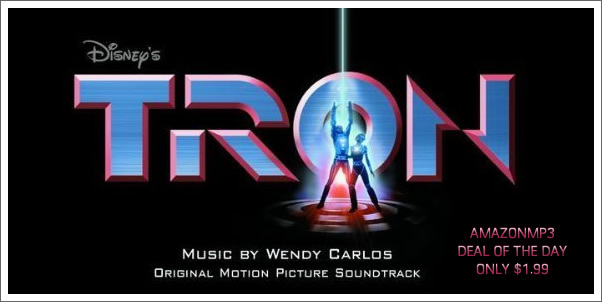 It's going to be all about TRON LEGACY next year, you should really get familiarized with the whole world of Tron and aside from watching the film, what better way than immersing yourself in the music of Wendy Carlos...and Journey, too? The original score to TRON is unique, electronic/orchestral hybrid experience with the flare that only the 80s could deliver. If you want to receive more immediate updates on the deals we come across, be sure to follow us on Twitter. Your purchases through our links definitely help to keep Tracksounds going, so THANKS! Definitely one of the finest scores of its era. The synth/orchestral blend was quite revolutionary at its time, and a lot of it is still very impressive today. Plus, where else can you find a love theme in 7/8?